We found ourselves one Sunday, late February in County Donegal, cruising the deserted country roads in search of a refill for our empty 6kg bottle of butane. Time was of the essence, the radio man predicted a yellow warning, a cold weather spell coming our way in the form of Winter Storm Emma and dealing with the oncoming minus temperaures inside Dixie with no gas to heat us or boil water is not an experience we would particularly like to repeat. Back in York last December at -5° Dixies door required defrosting before we could even get inside. Luckily this Sunday we came across Donagheys Motorhome in Letterkenny who not only refilled our awkward butane bottle but were happy to let us spend an hour browsing their range and part with even more cash than we had planned in exchange for a new foldaway table and a set of brightly coloured melamine dishes. By the time we got back to Dixie and unloaded our purchases the radio man was talking louder, faster, more frantic; Storm Emma had an E.T.A. now and was due to bring with her record low temperatures and unprecedented levels of snow, the likes of which had not been seen in Ireland in 35 years. Status Yellow Warning became Orange just like that. Now, he said, a polar vortex ominously dubbed the “Beast from the East” was en route from Siberia and on course to collide with Emma and cause an extreme weather event, predicted to affect all four provinces of Ireland and to last for days…. We hung up Dixies keys that night by Malin Head lighthouse, cosy and warm and grateful for our plentiful gas reserve and in the morning opened the sliding door to a blizzard. Over a quiet breakfast from our cheerful new bowls and cups we tuned in to the news again and in contrast to the mood in the van the radio man was near panicked, issuing much more serious sounding warnings now, up-to-the-minute weather watch reports and repeating safety precautions over and over. Status Orange had become Red while we slept. “Make no unnecessary journeys” he advised again and again and we laughed, both of us thinking how the last six months has been one long unnecessary journey. An hour later though, when coming temperatures between -10° and -13° were predicted and the blizzard outside was getting more and more assertive, we made the sensible decision to book ourselves off the road and into a local hotel or hostel. Now, regular readers will know our budget allows about €20 each a day (for EVERY SINGLE THING from diesel to gas to food to all other stuff) and although it pained us to think about the costs involved, our safety (and that of our vanhouse) was obviously much more important. And, our heater is broken indefinitely. -13 I don’t ever want to meet. Driving through Moville a couple of times in the preceding few days, we already knew our way around the picturesque little village perched on the eastern edge of the Inishowen peninsula about half way between Shrove and Muff. Moville Boutique Hostel, Apartments and Campsite is a big restored farm building set back off the main road and Dixie coasted warily down the slippy driveway, already icy in the early afternoon, a small indication to the extent of big freeze due in the days ahead. Excited by the prospect of being indoors, our first night staying outside of Dixie in 6 months, we parked her up, hurredly packed a bag and checked in. A warm welcome awaited us at Moville Botique Hostel where we chatted at check in and the friendly staff showed us around, the skylit library, the games room, the laundry area, the large communal kitchen with a roaring range blazing in the corner. Each bedroom in the hostel is named for a colour and we were booked into An Seomra Bui, the Yellow Room, our cosy little wood-pannelled hideout with far too many beds per human and cheerfully decorated with warm throws, woollen blankets and cushions the colour of the sun. A door led out to a bathroom and one door further to our own outdoor area, sectioned off with a little walkway and table and two chairs, the essential escape route for a couple of smokers like us. Being away from the van was a little strange to begin with but this place was all that we needed to wait out the storm and more, it was a real building! Oh the novelty of being indoors for an extended period of time! Off came the rainwear, hiking boots and thermals and on came the soft slippers and pjs and we had absolutely no problem at all getting reaccustomed to staying in a house again, happily killing time lounging around between real walls for a change, brewing endless cups of tea and sitting for hours, legs entwined on the lovely couch, watching the fresh white snow blanket the crispy cold fields outside. In the early evening we got bundled up for the short walk to the local pub Rosatos to enjoy a few drinks and a chat with the locals. Here we learned how to pronounce Moville correctly, (its Muh-ville not Moe-ville) not the first time we’ve made fools of ourselves this way, memories of Totnes and Paignton come to mind and even the locals there disagreed when we asked how to say their towns name. Although the open fire was roaring and the people friendly and full of Guinness and soon roaring too, we didn’t stay in Rosatos too long, we were too excited, for the snow, for the change of scenery and to get back to the comfort of our little yellow room. Walking back to the hostel, the freshly fallen snow crunched hard under our feet. In our gloved hands it warmed slowly into dense little balls of solid ice and almost refused to melt. We came to learn this kind of snow is called groupal – formed when snowflakes freeze and refreeze a couple of times over on their way from cloud to ground, and it is not at all common in Ireland, an extremely infrequent Siberian weather visitor. It wasn’t behaving like ordinary Irish snow anyway, sticking together in big clumps and piling up in on walls and trees and in draughts like white dunes, walls of snow taller than me. Rapidly forming icicles sprung from windows and walls and clung to leaves and hung from eaves, it was more snow than we’ve ever seen in Ireland. With many more days of freezing temperatures predicted we might be off the road for quite a while! I could talk for hours about how strange it is, sleeping in a building when you’re not at all used to it. Doors closed carefully far away still shake the room, floorboards creak even as bodies creep up stairwells and voices echo through the corridors from below. Footsteps, flushing toilets, any new house brings a whole plethora of different noises to identify and adjust to and this beautiful old farmhouse was no exception… for about 5 minutes. I personally had no trouble going to sleep in the large comfy bed, this one had a real mattress and it wasn’t made of steel and for once I didn’t need a hot water bottle as we had left the electric blanket preparing our new nest before our earlier jaunt to the pub. Such convenience and luxury is practically unheard of for us! After so many years of living in sunny Bermuda I thoroughly enjoyed spending the day playing in the snow. We were like small children, amusing ourselves for the whole afternoon and spirits were flying as high as the big and sometimes-too-accurate snowballs. Never ones to stray too far from tradition, work began immediately on a miniature snowvan. This groupal stuff was strange to handle and easy to mould and shape and baker William sculpted a snowvan just like he would sculpt the icing onto a cake. It was cold in Donegal but we never got the record-breaking lows like some communities in Ireland that week. We had made the right decision to stay put as over the next three days the Beast from the East battered the entire country, closing schools and businesses and with many of Ireland’s roads impassable, Dixie and her passengers were in the right place. Parked up! The more reports we saw of the destruction and interruption caused, the better we felt about our choice to hire a room. Besides, it is so much easier to really enjoy the cold, wet snowy weather when there’s the certainty of a warm, dry room nearby. Money well spent! It so transpired that one by one the other guests called the hostel to cancel their reservations, citing reasons like train delays and grounded flights and for almost three days we had the entire place to ourselves. The staff were friendly and helpful and the atmosphere just so laid back. I loved padding around the cosy library (pictured above) in my slippers, drinking tea and reading, watching the world outside disappear under the falling blanket of white. Moville Boutique Hostel is situated on a farm, a cute little organic place with ducks and sheep and geese and goats and the River Bredagh runs right through the property. Moville Community spent a lot of time and money restoring an old path along the Bredagh and the scenic walk is now a lovely feature of the town, looping from the main street through the farm, across one of Ireland’s oldest bridges, THE oldest and built by St Patrick himself if the sign is to be believed and why not, with a monastery nearby the monks surely used this path to access Bredagh Glen. These Donegal farm animals we met, huddled together and posing like a classic rock album cover are hardy, all weather types but even they didn’t know what to make of the weird groupal piling up around them. A long line of ducks and geese accompanied us on our first walk through the farm, quacking their questions loudly at one another and stopping occassionally to test a puddle or patch of ice and stare down at their flat rubber feet in confusion. The poultry procession followed us past tyre swings and fairy trees and wooden huts and sculptures to the crop garden at the back of the farm where their wide oval pond was frozen solid like a rink and the poor things ganged together and in unison, quacked their disapproval at us relentlessly until I quacked back in agreement. Frozen ponds are quacking appaling and something should be done! This goat seemed fine in his little wooden hut with a thick straw carpet. The afternoons were really quite warm between the blizzards and when the sun came out the bright light reflecting off the snow hurt our eyes, we went back to Dixie for our sunglasses. All along the river little garden birds showed their faces, pecking in the snow for some kind of sustenance, the sun warmed the air around and we watched overhanging branches crack the ice puddles on the still frozen surface and little icicles break from the frosty leaves and fall to the water below. Then just as quickly and with as little warning the temperature dropped, the grey cloud shroud covered the sky, the bitter wind-whipped snowflakes hailed down from all sides and we all ran for cover, the sheep on four legs to their corrugated, carpeted hut, the frustrated hens, ducks and geese on two to their lofty perches and sheltered coops and William and I in record time across the farm and into the safety of An Seomra Bui. Similarily to sleeping inside a building, I could wax lyrical about the joys of having hot running water at your fingertips, extolling the virtues of the hostels reliable plumbing and gloriously adequate water pressure but you must understand, living in a van has rendered us almost standardless and we are easy customers to please in this regard. We were also overjoyed to have our phones on charge all the time with little regard for any master battery. The kitchen toaster was quite the novelty and enjoyed much warm toast. One of the best parts of our stay was the open fire in the kitchen stove. Nothing beats warming yourself by the fire after a long and ardous day of snowball fighting and snowvan sculpting. Every morning, a basket of freshly laid eggs appeared in the kitchen for our use. Cereals, museli, fruit, teas and coffees and even hot cocoa were all provided free of charge and the communal oven, hob and dishes meant we didn’t have to go any further than Dixie to fetch other ingredients and feed ourselves well. While the rest of the country suffered through a nationwide bread shortage, every day a delicious loaf of fresh baked sourdough also appeared, right beside the eggs. I’m not going to say we ate the whole thing every time but there are certain perks afforded to the only visitors in a hostel… We had a great few days, we were content, clean, full-bellied, safe and warm. On the third day of our stay in Moville Hostel we both woke up bored. Cosy and snug and comfortable, but bored. My feet were warm and dry but they were also itchy. Not the hostels fault for sure, but the big T.V. was the only window we could see from bed and that was getting…well, boring. Flicking through the channels mindlessly (a habit so easy to fall back into again) we saw only repeats; the same news shown every hour, 1990s sitcom re-runs, mindless talkshows or extremely old movies. The worst of the Beast from the East had passed Ireland now and the focus was on clean up, starting with the roads. We took a morning walk again along the muddy track over the river and through the farm to the main street. The newly refurbished Moville Shore path that follows the lands edge all the way to Greencastle was a tempting trek but the wind was still too cold and the offshore breeze blew in to bite and slice at our faces. My frigid digits were turning blue. Oystercatchers, their spindly legs stubbornly rooted in the thick estuary muck shook and swayed in the sweeping squall but held firm waiting for their supper, this harsh spell must be so much worse for the birds. Most of the snow had been cleared from the streets and pushed into piles on the verges and we navigated the icy paths with trepidation, deciding quickly to double back towards the hostel and defrost our noses and our toes. Moville is a quirky, colourful little town to explore although with the Status Red Warning there were no businesses or cafes open, we will have to return again in better weather. Back in the warmth of our pretty yellow room in Moville Hostel, we looked down upon Dixie parked in the lot below. The hostels driveway had just been cleared of snow and the future forecast was cold but bright and sunny. Dixie was ready to go. We were ready to go. Itchy feet and a thirst to see what is around the next corner, both of us missed the adventure of finding a new place to park for the night, the excitement of waking to an incredible morning view. 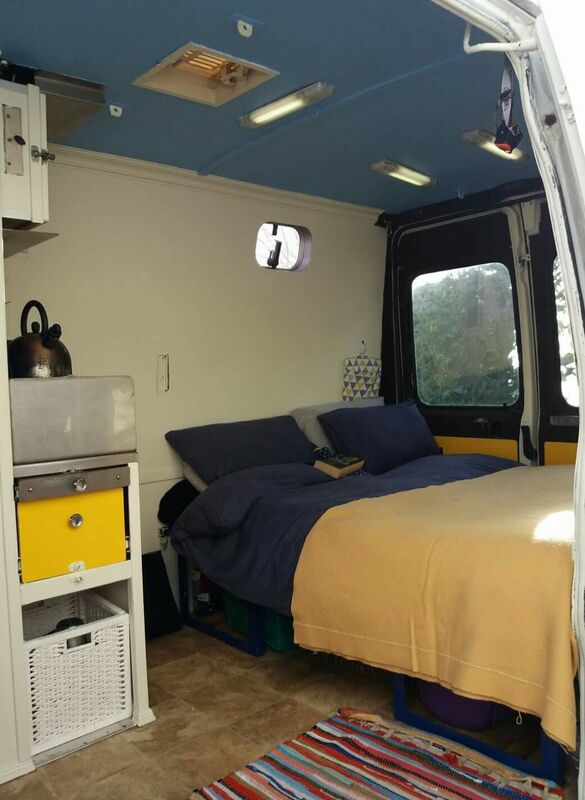 We even missed the smallness of our living space inside the van, the closeness and intimacy of daily life in our home on wheels, it’s like a kind of game and we just want to keep playing. We stopped for the right reasons as extreme weather conditions need to be taken seriously and the last thing we’d want is to be a burden on our countrys already stretched services if an accident should happen. We just happened to stop in the right place too, by coincidence, Moville Hostel has just the perfect mix of quirky and comfortable for us and it’s location on an historic, beautiful site is a huge draw. Definitely a place we would love to return to one day and somewhere we highly recommend. We checked out of the hostel, handing back the keys and exchanging cheerful well wishes with the staff on our way out. The Beast from the East was almost gone. We were back in the Backwards Van. The snowvan was melting on the picnic table as we warmed Dixies engine and secured the back for departure, more of a snowlump now than a van, a steady stream of crystal clear tears drip dropping perfect circles in the groupal below. It all sounds so cosy. Perhaps this room was your inspiration for Dixie’s new colour scheme? That lovely bright yellow? Love your posts! You should be writing/selling to travel companies!! Other social media like Twitter, Facebook, and Instagram could help u route folks here. Just down to earth with great content. Good Job!!! Thanks so much Dwight for your positivity 😊 Honestly that would be wonderful to get paid to do this, it might be in my future! Meanwhile I’m loving the exposure from the nomination at Irish Blog Awards!! Thanks for reading and if you could give us a share on FB (OR send some TWEETERS our way) that would be great 😉 have a great day Dwight!